Scientists have created a new insulating material from wood that bests Styrofoam: it’s “stronger and much more environmentally friendly,” according to the University of Maryland (UMD). Their material, called nanowood, can come in thin, flexible pieces or in blocks — take a closer look after the jump. The UMD-led team created nanowood by removing lignin, a substance in wood that keeps it rigid and brown. They also took out some short fibers “that tangle themselves in with the cellulose fibers that make up the scaffolding-like base structure of the wood,” according to the university. “The aligned cellulose fibers then bond with each other and results in a high mechanical strength.” When the team attempted to crush the nanowood, they discovered in one direction the material was 30 times stronger than thermal insulation materials like Styrofoam or aerogel. When testing how well nanowood insulates, they found it blocked a minimum of 10 degrees more heat than a Guinness World Record honoree for best insulator, silica aerogel, as well as Styrofoam. And while wool or glass insulators can irritate lung tissues or incite allergic reactions, according to UMD, nanowood’s fibers don’t cause those issues. 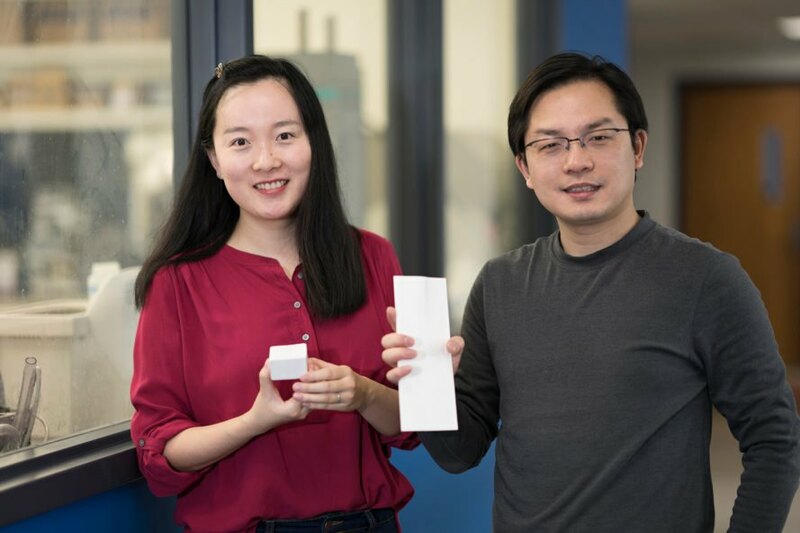 UMD postdoctoral student Tian Li said of nanowood in the statement, “This can insulate better than most other current thermal insulators, including Styrofoam. It is extremely promising to be used as energy efficient building materials.” The journal Science Advances published the research earlier this month. Scientists from the University of Colorado Boulder and KTH Royal Institute of Technology in Stockholm, Sweden contributed. UMD said Inventwood, a spinoff company from the research group of Liangbing Hu, UMD associate professor involved in this research, is commercializing wood-based nanotechnologies. Hu said in the statement his research program “experiments with nature’s nanotechnology that we see in wood.” Inventwood’s website lists transparent wood and clear paper among their technologies.